An insight into the popular nuno-felting technique; which is essentially felting into fabric and vice versa. 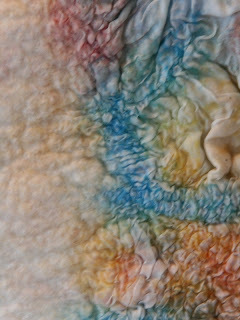 We will be looking and sampling several fabrics that can be used to create amazing texture to your felt work. this covers a treasure bag full of special fibres, wool, fabrics etc. and a length of silk for the final project. Limited spaces available, please ring or e-mail for booking.